I often think that J (my sometime dining companion) speaks an entirely different language to me (her being a tad younger than me – cheeky cow called me a grandpa in an email the other day!!!). Totes amazeballs is one expression she uses that bemused and confused me no end until I visited Burgershack in London. 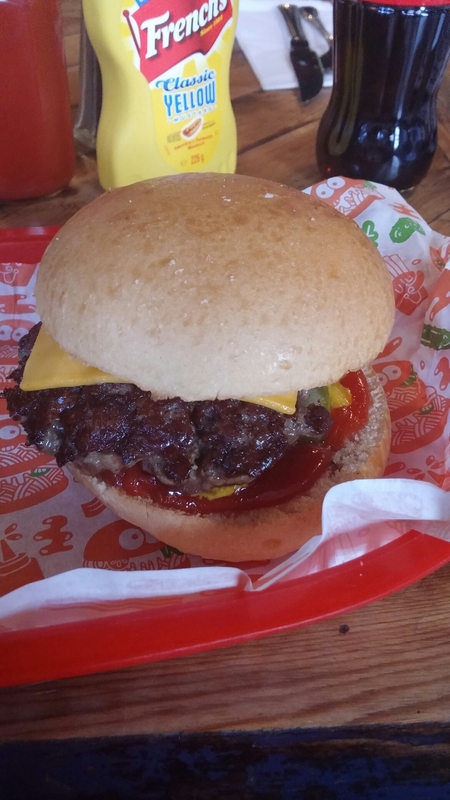 Burgershack is the brainchild of burger afficiando, Burgerac – who in collaboration with a boozer in Marylebone has moved from merely writing about burgers he has eaten (and boy has he eaten loads) to selling them. Tough ask turning from poacher to gamekeeper, so to speak, but who better to develop burgers to please the masses than someone who has tried pretty much everyone out there. 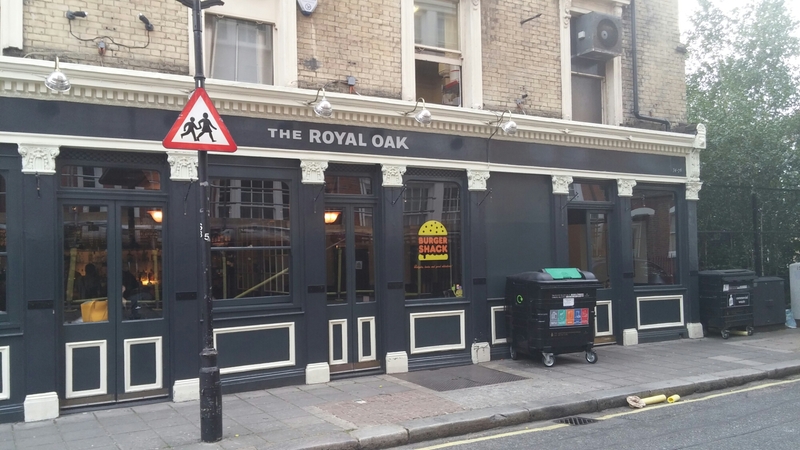 The Royal Oak pub (where Burgershack is located) is what I would call a proper boozer. Not quite spit and sawdust but nothing too fancy. I liked it. I particularly liked the great soul music, played at a tolerable volume for an oldie like me. 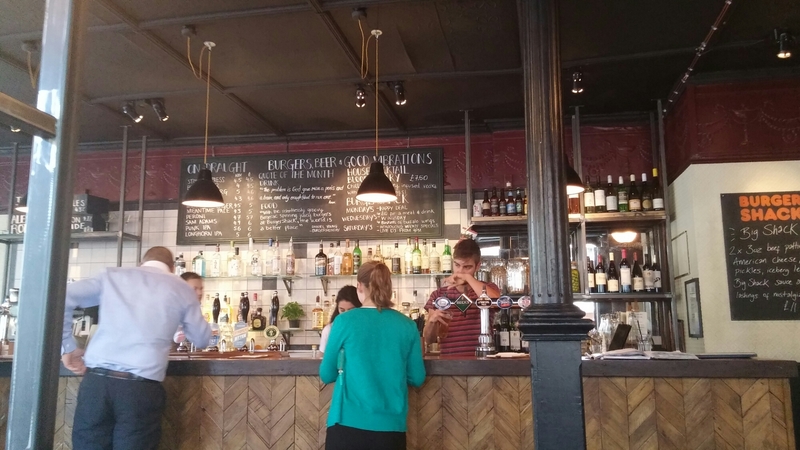 Oh joy of joys – they take bookings (I didn’t book, but find the trend for no booking a pain) and whilst not busy (the pub itself was) when l arrived at 6.00pm on the dot (when they start serving in the evening) all the tables were booked for later. Not bad for a Tuesday night. 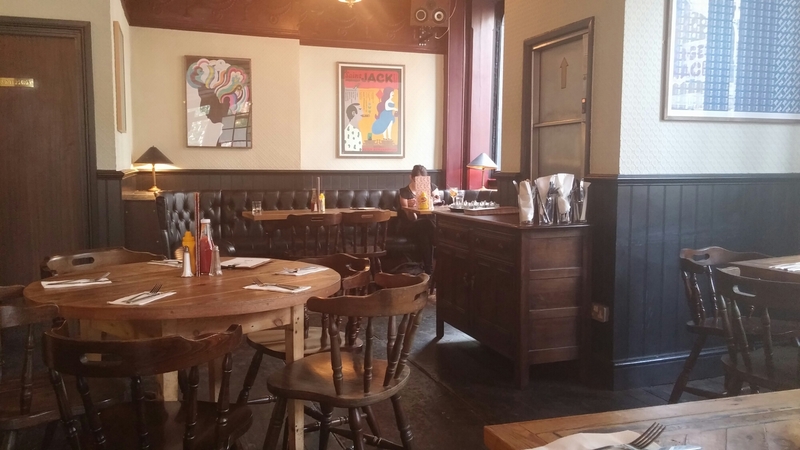 All in all a nice place for a feed or a pint or both and only 15 mins walk from Paddington station (or 5 from Edgeware Road tube station). Great, therefore, if you have a bit of time before your train home westward. 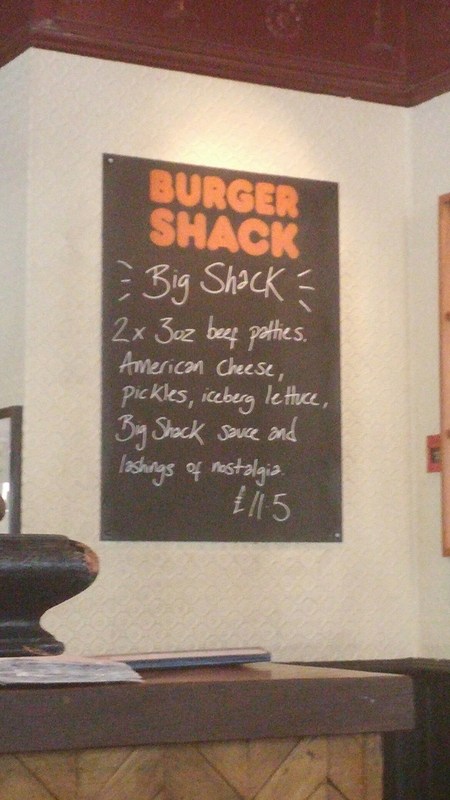 They also have a weekly special on a board – on the week of my visit it was, their ode to the Big Mac, the “Big Shack”. Whilst tempted by all the burgers on offer (including a chicken one fried in lard – which made me positively coo), I went quite basic with my burger, going for the cheapest option in the form of “The Cheese Burger (The Dirty One)”. It was described as coming with American cheese, onions, pickles, ketchup and mustard. I liked the simplicity of it. 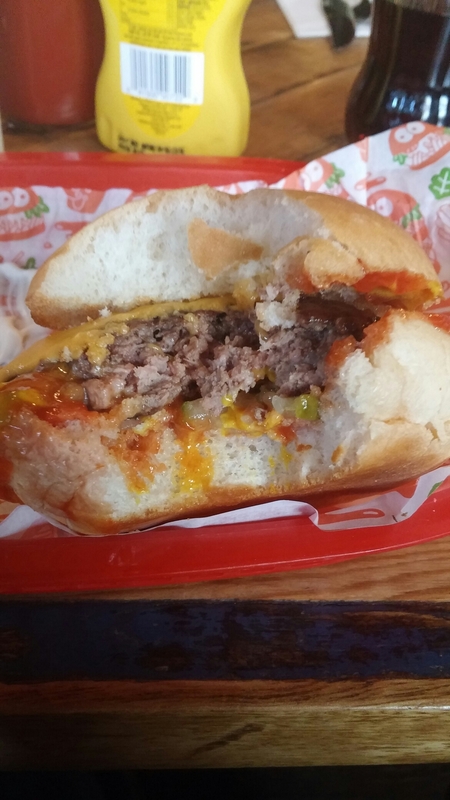 It is a burger to show off the main event in the form of the meat patty rather than the side show in terms of extras loaded on (take note Five Guys!). At £8.50 (on its own) this is not a cheap burger (especially as it is the entry level one here), but you do get a 6oz patty made from a blend of 35 day dry aged chuck, brisket, and rib – cap, with bone marrow added to the mix (pretty much the perfect combo for a burger). These patties are made specially for Burgershack by The Butchery (whose beef looks awesome). I was asked on ordering if I wanted it other than medium rare (I could have kissed the barman for saying that) as that is how they cook it, unless otherwise specified. Exactly how a burger should be cooked to my mind and cooking meat of this quality over would be a travesty in my opinion. My burger arrived relatively quickly, but long enough for it to have been cooked to order. It was a good looking beast and, on inspection inside the bun, the patty had a nice crust on it. The interior was as advertised – my phone camera does not really show it had the requisite hint of pink, but it was there. hockey puck- esque burgers I have had) and was lovely and juicy. Flavour wise it had a lovely beefy savouriness to it (no doubted aided by the inclusion of marrow bone), which you regrettably seldom find in burgers and beef in general these days. All in all it made for a mightly fine burger. Very yummy indeed, with crisp, good pickles adding nicely to the overall balance. It was dirty in that good “I need more napkins” way, but was capable of being eaten hand to mouth without too much drama. Amazingly my tie came out unscathed. My only slight issues were the cheese could have been more melted and the bun (which was lightly toasted) was just a touch on the airy/too fluffy side for my tastes. Minor quibbles as against the outstanding beef patty. 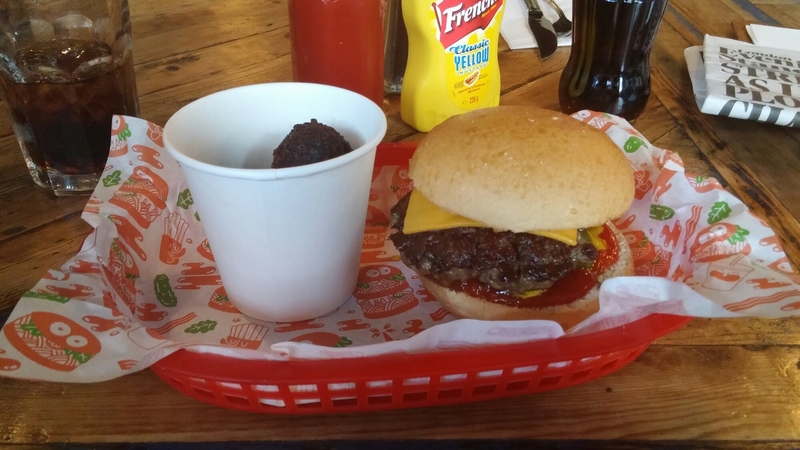 I don’t feel the need to always have fries with a burger (you don’t when you have a BBQ at home do you – well I don’t) and instead went for a meat based side in the form of their pingpong size Amazeballs (£4 for 2). These deep fried balls of rich moist pulled pork were truly totes amazeballs (I believe, J, that is the correct use of the term). I declined the BBQ sauce on offer (not sure why) and went for a self made mix of French’s mustard (on the table with ketchup) and mayo (bought to the table on request) to go with them. 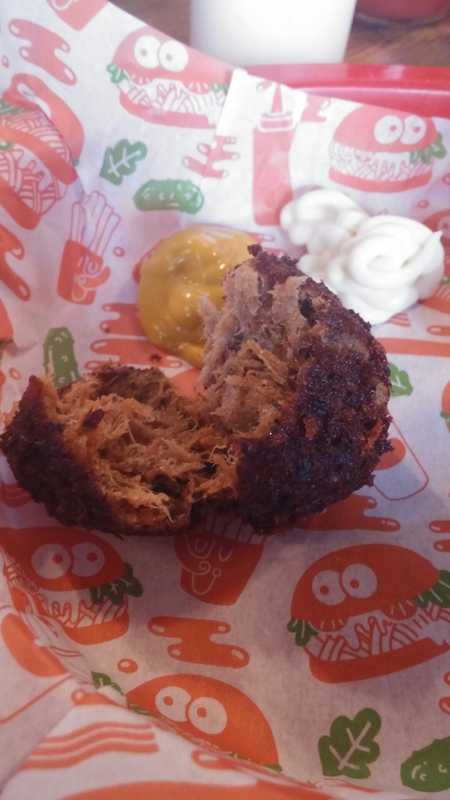 The vinegary tartness of the mustard, tempered by the mayo, worked well with these pulled pork balls of loveliness. I suspect they would have been even better with the BBQ sauce. 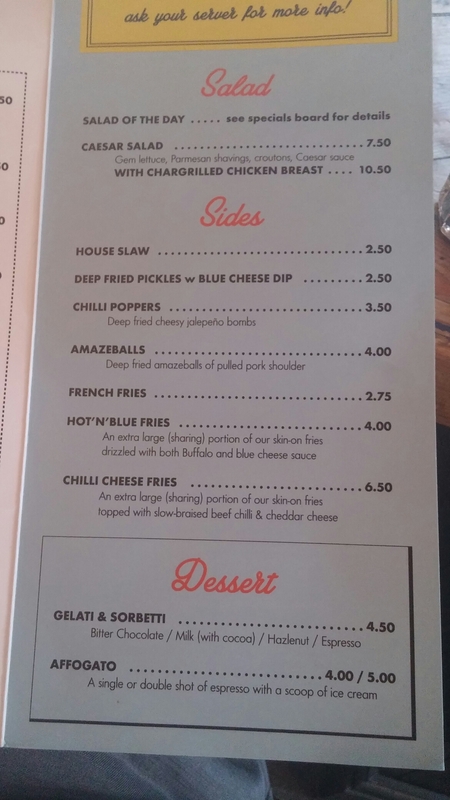 All the sides sounded good, especially the deep fried pickles with blue cheese dip (£2.50) and the chilli cheese fries (£6.50 for a sharing portion). Ones to try on subsequent visits. Standard fries were £2.75. The Royal Oak, being a free house, has some decent real ales at the bar – including a personal favourite of mine Timothy Taylor’s Landlord. I didn’t get a chance to look at a wine list. I was driving later so decided on no booze (plus had a bit of work to do whilst on the train back) and went for boring old coke (£2.50). This was thankfully from a bottle rather than the filthy stuff that comes from those soda shower heads. 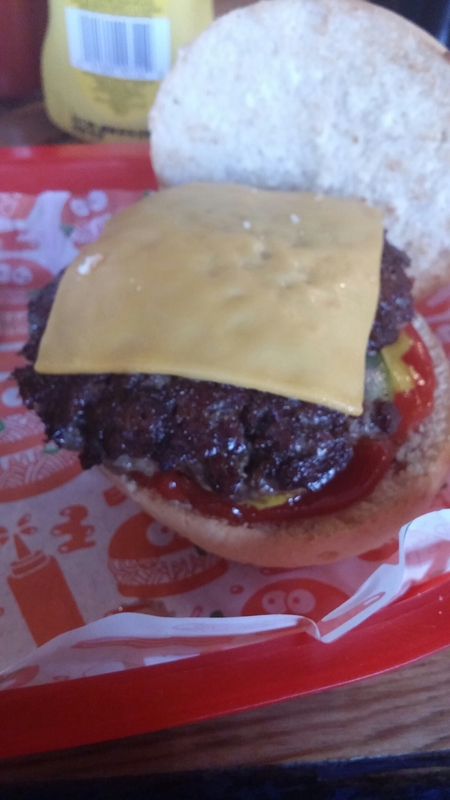 I really enjoyed my meal at Burgershack. Not cheap (£15 for the burger, amazeballs side and a soft drink), but quality rarely is and what I had here was a top notch burger, with an interesting, imaginative and above all tasty side. 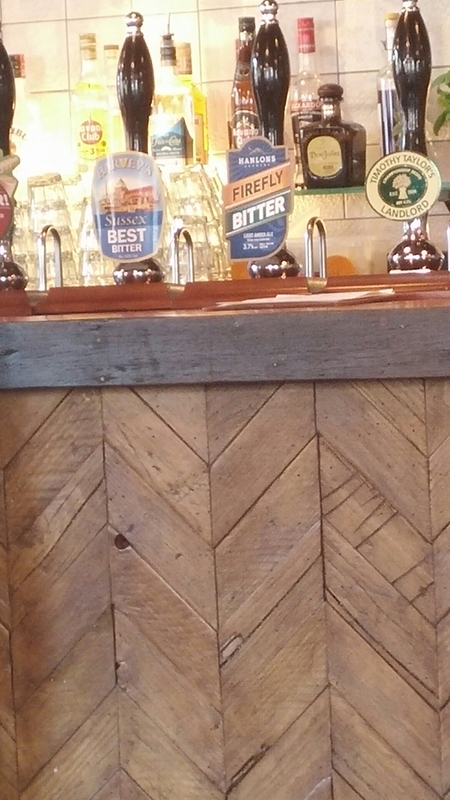 Add to that its location in a proper boozer with proper beer and a nice vibe and it pretty much tick all my boxes. Would I go again? Oh yes, can see me “accidently” missing many a train back home for a burger in this place. They also do takeouts at certain times (you need to call to check). 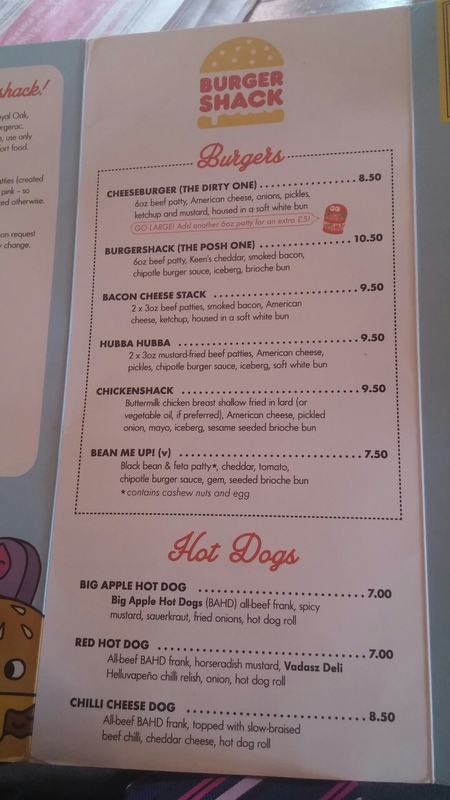 This entry was posted on Aug 16, 2015 by solicitingflavours in Alcoholic drink, Bacon, bitter, Burger, Burgerac, burgers, Burgershack, dog friendly, Drink, Food, Food and wine products, Fried chicken, london, lunch, Non alcoholic drink, Outside Wales, Real ale, Restaurant Review, review, Sandwich, The Royal Oak, Marylebone.